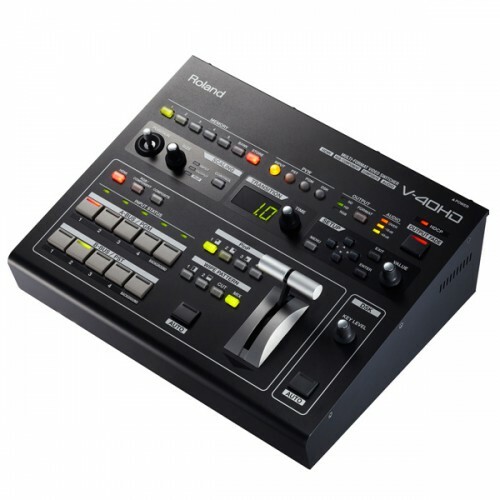 The Roland V-40HD Multi-Format Video Switcher is a true multi-format video switcher, meaning it doesn't require input sources to be matched to output resolutions. Every input has its own broadcast quality scaler that can individually scale, stretch, crop and zoom each source as needed for the output resolution chosen. A Multi-Zoom feature can be enabled when one video input is shared internally with up to three more inputs. The scaler for each input can zoom into any position in the video image to give the appearance that additional cameras are connected, thus creating a virtual multi-camera environment. LEDs indicate input status. Signal processing is 4:4:4 at 10 bits on input and 4:2:2 at 8 bits on output. Effects include a Downstream Keyer for compositing logos and text into output video. An audio input bus enables audio to be embedded onto the HDMI outputs. An Audio Delay feature aligns timing with video for perfect lip sync. You can control the switcher via any MIDI device. And you can use RS-232C for integrated remote control. Additional V-40HD units can be added into the mix for more inputs.